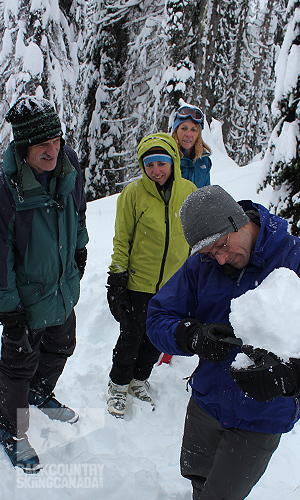 Few things in life are clearer than the reasons why backcountry skiers should take a Canadian Avalanche Centre-approved avalanche training course (referred to in Canada as Avalanche Skills Training, or AST). As well as the probe/shovel/transceiver trifecta, an avi course is likely the most valuable investment you can make in contributing to your safety and those with you. I have been ski touring for 20+ years, and though I have taken some courses in the east and participated in numerous transceiver training sessions as part of cat/heli and hut trips, the 2–day AST I course I took with Summit Mountain Guides’ David Lussier was my first real course. Shame. The AST curriculum was developed by the Canadian Avalanche Centre (CAC) starting in 2003 with support from the National Search and Rescue Secretariat’s New Initiatives Fund, the collaboration of the Canadian Ski Patrol System, the Alpine Club of Canada and others. There are two recreational level courses, AST 1 and, you guessed it, AST 2. AST I is an introductory-level course which necessarily includes 7 hours of “theory,” or class work, and one field day. 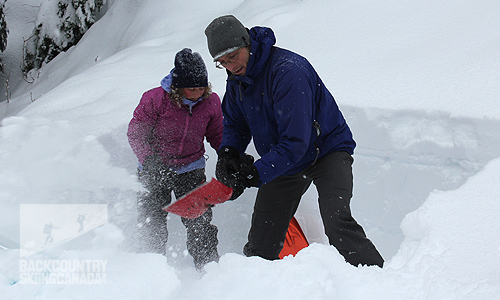 It is intended to cover the basics of backcountry avalanche awareness and companion rescue. AST 2—which I won’t go into much—is the highest level of training for a recreationalist like me. It’s way more heavy duty than AST I and includes a minimum of 9.5 hours of classroom studies and 3 days of field instruction. Some instructors may offer AST Level 2 that is up to seven days in duration. I hope to take the AST 2 course later this season. Luckily, the CAC has built a pretty tight curriculum for the AST courses. This means that, hopefully, regardless of your teacher, you are going to experience a somewhat similar, high-quality program. Like we all remember from high school though, the teacher can have a big impact on the course experience. Summit Mountain Guides’ (SMG) lead guide is David Lussier and he was the teacher for the weekend. SMG enlists the help of other guides to teach some of their courses and I am sure they are quite capable. I was happy to learn that David was instructing because of the depth of his experience. David also has the ACMG / IFMGA ticket, meaning that he is a full “mountain guide”(not just ski). He has trained and guided a lot all over the world. So what about the course? I have already sung the praises of all AST courses—how about the one I experienced with SMG? It was, in a word, excellent and highly recommended (OK, that’s more than one word...) David is 100% into the material, brings real-life experience and is a people person. He was able to maintain the interest of our class of eight, even though our experience varied from lots to not much. It was clear that Dave enjoyed his time in the field more than in the classroom, but who doesn’t. How did it all unfold? Bruce Jamieson’s Backcountry Avalanche Awareness was assigned as pre-reading and a series of questions were provided to get our brains working before the first day. Day one was mostly spent in the classroom going over the basics of avalanches and travelling safety in terrain that could be risky. The required content is selected by the CAC but individual instructors have some flexibility in how they deliver the material. David worked from a PowerPoint presentation and included a number of illustrative videos to make the course content all the more real. 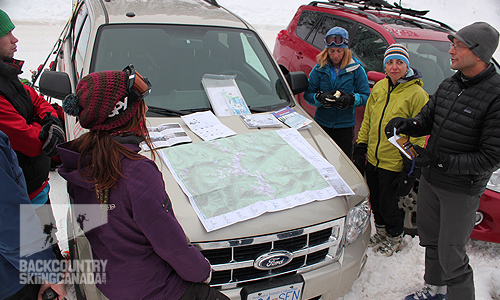 Topics included such fundamentals as: common signs of avalanches, different types, common triggers, terrain choices, snowpack analysis, the impact of weather and much, much more. We looked at the Avaluator tool and discussed the importance of a pre-trip plan. At about 1:30 that day, we headed up to Whitewater Ski Resort to the beacon practice area adjacent to the parking lot. We went over the basics of transceivers and ran a few rescue drills—a very high-value activity. We ended off day one with a little classroom wrap-up. There was a lot of information to absorb during the day—good thing we were given a copy of the PowerPoint presentation and had our Backcountry Avalanche Awareness book to review. Day two got us out into the mountains, which we were all happy about. Check out the photos below for an idea of what we did. We toured around the Evening Ridge area looking at different terrain features and assessed them with the help of the Avaluator. We dug two pits (one “hasty,” one not) and had a good look at the snowpack. Though we got a few turns in, it was more about avalanche skills than skiing pow. The day ended up with a full-blown rescue exercise with two burials. We were forced to think, and act, fast. It’s always incredible how illuminating an exercise like this can be. Proof positive that practice makes perfect. David digs (with the help of Madelaine, a teacher in training who was “shadowing” him during the course). The finished pit. Already about 130 cms in early December. 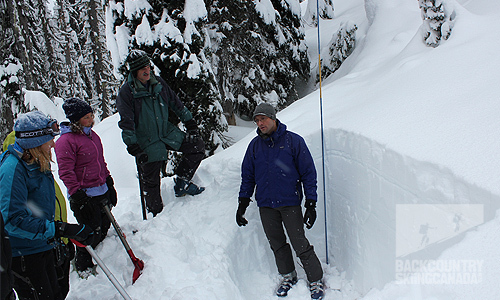 It was very interesting to look at the snowpack’s history and identify potential issues/dangers. 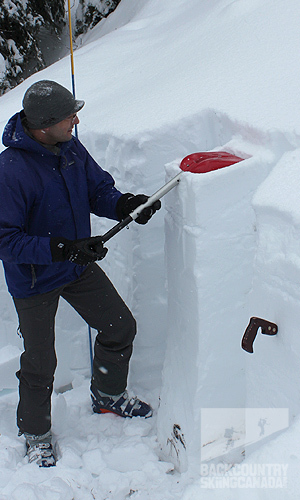 A shovel test helped us see the weak layers. Dave took his time in the pit and made learners curious. Good stuff. Here’s where we took out the loop for a closer examination of the snow crystals. We even managed to fit in a couple turns. 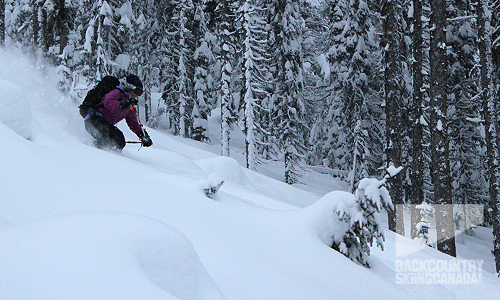 Here’s Madelaine shredding some pow. Final debrief up at Whitewater resort. It was a pretty packed two days but there’s no better way for a backcountry skier to spend his or her time. 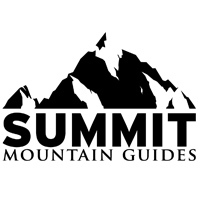 I give three thumbs up for the Summit Mountain Guide’s AST I course. It was very informative and offered a good mix of theory and practice. David Lussier has a deep understanding of travelling in the mountains and his enthusiasm was contagious. The rhythm and pace of the course was such that we were all engaged and learning for two full days. The pre-course reading and post-course feedback form were also appreciated. It’s clear that SMG will continue to evolve and improve this course with learner input. Totally key. 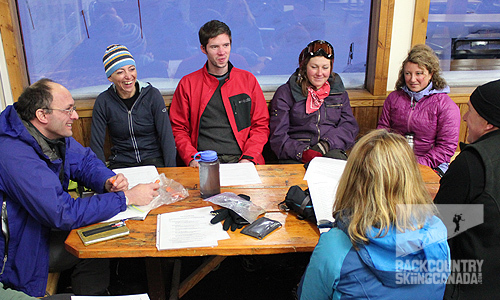 If you are a backcountry skier/boarder, taking an AST course is a must. Look for an instructor with lots of experience and be prepared to learn things that may save your, or someone else’s, life. Where: Nelson, BC and environs. A great course taught by a great teacher. Take it. None to speak of. Minor things—returning back to the classroom at the end of day one for an hour was a bit arduous. The pre-course questionnaire wasn’t explicitly referred to during the course.